I know I will kick myself next year if I don’t write this recipe down and post it here. I use my own blog as a cookbook so if I don’t put it here, I will never find my scribbles; usually on the backs of envelopes. Anyway, I love sausage stuffing but it never tastes like I want it to. Sausage stuffings often use cornbread which I prefer not to use. I know lots of people couldn’t have stuffing any other way, but for me it just doesn’t float my boat. I had no plan before making this stuffing, just a bunch of ingredients I thought might taste good. Another issue I have with sausage stuffing is the seasoning…it’s never right. I’ve used all the best quality sausage and a range of flavors from mild to spicy….but it has always fallen short. This year I used Jimmy Dean Regular Sausage and the seasoning was perfect, just perfect. Who knew. I also wanted a hint of sweetness with the savory taste so I threw in dried cranberries and it was the perfect finishing touch. Everyone loved it, end of story. Before making stuffing, you have to stale the bread at least a day ahead. You want to dry up the starch cells so they refill with flavorful liquids. Tear or cube bread into smaller pieces before staling. You can also do this in the oven to speed up the process (350 degrees for 15 minutes). You only have to do this with the artisan bread. The stuffing cubes from the bakery will already be dried out enough. I use both kinds of bread because it’s nice to have the different textures of the real crunchy stuffing cubes and the torn pieces of artisan bread. In a large skillet, melt butter over medium heat. Add onions, celery, sage, rosemary and thyme and cook until softened, about 7-8 minutes. Scrape the vegetables into another bowl and let cool. To the same skillet add sausage and cook until no longer pink. Add garlic and cook until fragrant, about 30 seconds. Remove from heat and let cool slightly. Once the vegetables and sausage have cooled place them into the same bowl with the bread and stir in stock or broth until fully incorporated. This is where I taste the mixture (before I add the eggs) and season it to my liking with salt and pepper (sometimes it takes quite a bit). Once I’m happy with the flavor I add the eggs and mix thoroughly. Place the mixture into two generously buttered 9 x 13 baking dishes and bake for 30 minutes at 350 degrees, the top should be lightly browned. Serve hot. You can bake this the day before and place in the refrigerator overnight. Remove from the refrigerator and bring to room temperature before reheating in the oven for 30 minutes. Sounds wonderful! Did you really use 11 eggs? Yes, because 16 cups of bread is a lot, plus all the other ingredients. That looks and sounds wonderful, even if it does have 11 eggs! We like eggs around here. A lot! Awesome! I’ve found I prefer regular bread stuffing as opposed to cornbread stuffing myself. I’ll have to try this, it looks fantastic. Sounds just perfect to me! I love the sweet and savory combo. BTW, your recipe is a great dressing! This is pretty much exactly how I make my stuffing except that I use sage stuffing and it’s the most coveted dish at our holiday dinner table! I hope I can find this one next year when I stuff my Thanksgiving turkey. We usually have cornbread dressing, but I don’t mind trying other recipes. It could be another side dish along with the cornbread stuffed turkey. You photo of the dressing makes me hungry for it. 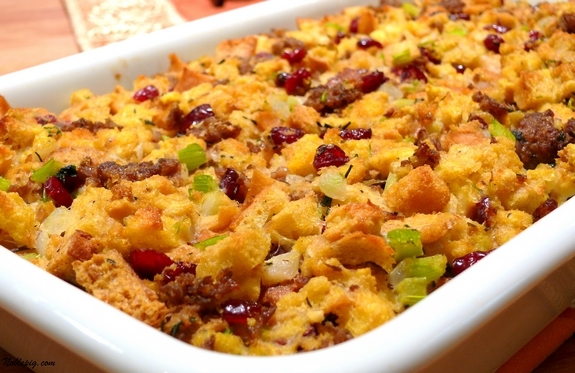 What a great idea to put cranberries into the stuffing! Love it. That really sounds good! You rock making your own bread just to cut it up and make stuffing! Love the cranberries! Throw in a few postachios and you would have another twist to this already delcious stuffing. All things Jimmy Dean are great! I do a dirty rice with Jimmy Dean Hot sausage. Someone has already mentioned sage, but it deserves another nod, Jimmy Dean Sage sausage is excellent. 11 large eggs???!!! WOW! Sounds great though, love the idea of adding cranberries. my recipes are everywhere too. This sounds delicious! Stuffing is one of my favorite foods, I’ve never made it with sausage, but I will give it a try! I use your blog as a cookbook too, haha! Yours look beautiful though and I bet for those who like stuffing would really dig it! Wonderful stuffing, I would also use it to stuff the chicken. This sounds terrific but more like a bread pudding than a classic stuffing. I’m intrigued and will have to give it a try. okay…at the risk of sounding crazy…what exactly is this “8 cups store-bought bakery made stuffing cubes”? is it pepperidge farm herb stuffing mix???? i would like to add this to my Christmas dinner table…oh and by the way…you rock sistah!! My bakery always makes it’s own stuffing/dressing bread…if you do not have a source like that, use any stuffing bread…I guess the boxed would be okay as long as it is not seasoned. You have phenomenal recipes. Thanks. Stuffing is my favorite part of the meal, and yours looks perfect! Wonderful flavors. I have made this recipe for the last 2 years and it is excellent! My family thinks so too. This is very similar to my family recipe, sans cranberries. We always use regular bread instead of cornbread and I use Jimmy Dean, although my grandfather used Jones. It wouldn’t be Thanksgiving without it! Now I just have to perfect my turkey…I’m counting on you Cathy 🙂 Have a great Thanksgiving! I love your recipes. I am going to make the dressing now before the holidays to try it out. How many servings does this recipe yield? Can I substitute some of the eggs with heavy cream? One pan full, it depends on how much each person takes, could be 10-16. No on the cream. I haven’t been able to find jimmy dean regular sausage. Can I use a pound of jimmy dean ready to eat breakfast links? Hmmm, I mean you can, it just won’t be the same texture and dispersal throughout the recipe. Not sure about the seasoning either.